I am sharing and would encourage my readers to check out the latest offer from Victoria Knight! Love Paranormal Romance? Grab It 75% Off! For a super short time, bestselling author Victoria Knight is having a 75% off flash sale on her steamy vampire romance “Monsters Within” and you can get a copy for only $.99! Red Creek, Massachusetts is a quiet town. Nothing ever happens, and nothing ever changes – a feature Saul Benton, local recluse and member of the Benton Vampire Clan, appreciates deeply. Unfortunately for Saul, his peaceful existence is soon to be mercilessly destroyed. Evil is closing in on the Benton family and Red Creek, seeking to obliterate all Saul holds dear. Which makes Saul’s attraction to Nikki Galimore, a mortal woman, and brat extraordinaire, all the more inconvenient. Too bad his heart did not seem to have received the memo. Join romance readers around the country for some of the best games and prizes available from romance authors during the month of March. Each day in the month a different author will offer prizes such as ebooks and more. All you have to do is play the games to win! Mark your calendar for March the 17th. Up for grabs on my page will be the first book in The Loflin Legacy, Comanche Haven. Enter for your chance to be a winner. Here’s the link. While you’re there, check out my other books as well. I look forward to your comments. Happy reading! Beyond the Veil Review – Celebrating Friday the 13th. Thanks to Jane for the detailed look at my new series called Shadow Company. As with beginning books, an author sets a stage for the characters in which to live out their stories. Her insight into the background and intentions of the author or dead on. I want to give her a high-five for her diligence and support. Please enjoy her review below. Oh, by the way – watch your step today. It’s Friday the 13th. 5.0 out of 5 stars.shadow-walkers, demons , portals, Netherworld and veils, with Seeders and Warlocks.. and Marie Laveau. OMG-WOW. .shadow-walkers, demons , portals, Netherworld and veils, with Seers and Warlocks.. and Marie Laveau.. what a story. . Details are intricate. .the story is intriguing and interesting. . I love the characters. And am surprised by the story line… It took me differently than I thought it would. Aubrie Sinclair, a seer from a long line of empaths -meets-Logan Latimar, an ex-Navy SEAL and warlock. Now Girl meets Navy Seal is enough to be a super Hot read, but then add the paranormal to it and WOW!! Logan returns from war to work in his brothers garage, but war doesn’t leave him, the dreams come and they seem to bring not only the past but the present with them. Aubrie is not only a seer, but a budding author who lives alone with her two dogs, and a horse out in the country and gets visits from a friendly shadow-walker at times. But now she’s pulled into dreams of a war with the hometown hero Logan, while being stalked by a demon portraying himself as a shadow-walker. Will she help Logan with his dreams ? And will he rescue her from them and her own trouble with her stalker too? And will Love, the purest form of good help both? I don’t give away spoilers, just advice.. READ THIS FANTASTIC BOOK!! Posted on January 13, 2017 Author catherinewolffe53Categories Amazon, Catherine Wolffe, celebration, empath, Facebook, Guests, New Releases, paranormal, Reviews, Romance, Social Media, Uncategorized, voodoo, Warlock, writingTags Amazon, Authors, books, creative writing, dreams, ebook, Ebooks, f, Fantasy, Freedom, Inspiration, Love, military, Navy SEALS, reviews, Romance, Support, War, Warlock, writing5 Comments on Beyond the Veil Review – Celebrating Friday the 13th. 2017 is just around the corner. Saying goodbye to 2016 will not disappoint me overly. The year proved challenging and demanding in new and unique ways. 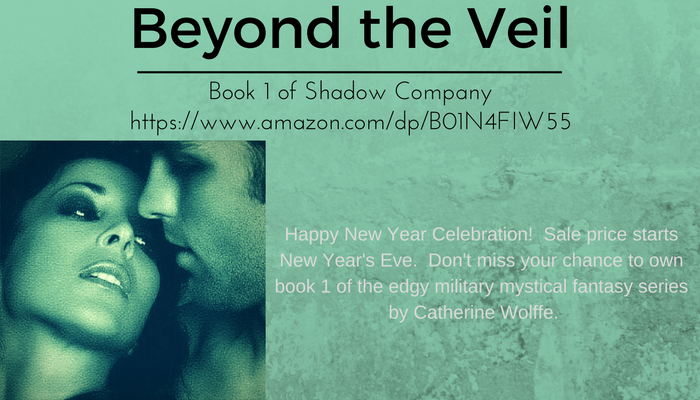 So I bid the year adieu with a small celebration for my latest book, Beyond the Veil, Book 1 of Shadow Company. Please join me for the Facebook event scheduled to begin tomorrow. Drop by and pick up the book at half price for a limited time. In addition to the price reduction, you can register for a grand prize drawing. I’m giving one lucky reader a set of autographed CW paperbacks. All you have to do is share the book on Amazon to your page on Facebook. Copy the link in a post at the event, and you are in the drawing. There will be other prizes throughout the three-day event. I look forward to sharing the incoming year with you and celebrating with friends. Happy New Year and thanks for dropping by. Aubrie Sinclair, a seer from a long line of empaths, considers her talent a gift and a burden. She’s a loner until she meets Logan Latimar, the ex-Navy SEAL, and warlock. Sparks fly as they discover each other’s talents as well as hang-ups. One thing they have in common is their battle with the evil demons known as shadow walkers living between worlds and stealing memories for their own pleasure. Seekers of truth and justice, Aubrie and Logan face a threat and discover their genuine purpose. All material is copyright protected.